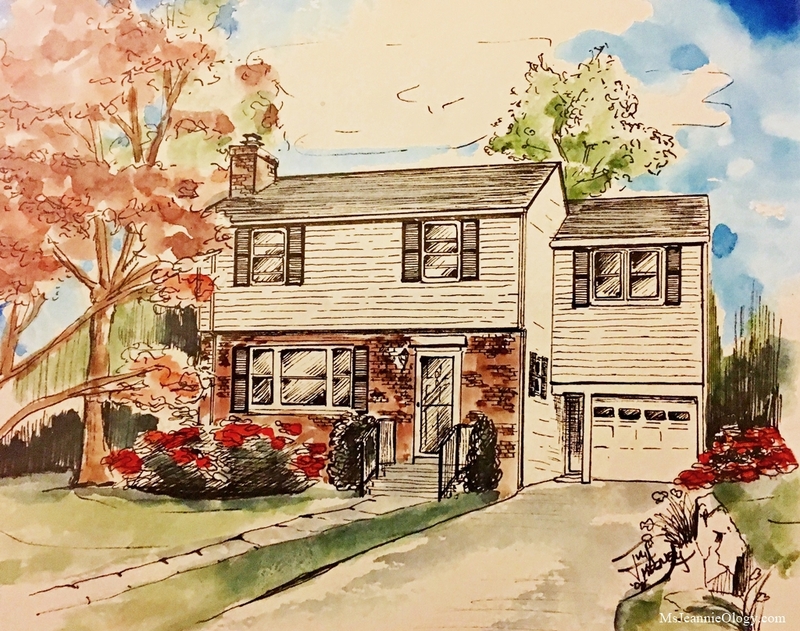 An artistic rendering of Michael and Renee’s vintage house on the outskirts of New York City. Today we are announcing a very exciting multiple part series here on the blog based on real-life history-making circumstances that are facing two of our readers. You’ll remember these familiar faces, Michael and Renee as winners from our Sparta giveaway last November. In communicating during their prize winnings and exchange of recipes they shared exciting but daunting news that they would soon be undergoing a kitchen renovation in their 1940’s New York colonial. Not new to the reconstruction game (these two have been updating their house for the past several years) this kitchen project in particular kept getting put off because it was going to take three months. Three long months for two people who are crazy about cooking. The thought of 90 days of food preparation among tarps and tape and sawdust and drills and hammers and workbenches during cold, wet winter sounded anything but appealing. But alas with a firm “Let’s begin,” from their contractor, the project could be put off no longer. The time had come for Michael and Renee to embrace the chaos that is a historic house kitchen renovation. In submitting finally to this process a challenge has been posed. Can these two epicureans figure out what and how to cook when a fully functional kitchen will not be accessible for the next 270 meals? Can their sanity keep up with their ideal determination not to eat out or order in during the entire phase of construction? What will these two gourmet cooks and farmers market foodies make during this three month stretch that will keep their hearts happy and their stomachs satisfied? Can they stay true to themselves and approach food in their normal, healthy, excited-to-cook-for-you kind of way? Or will they succumb to the frustrations and inabilities of not having continuous access to the proper prep space, cooking equipment, storage facilities or clean-up stations? Will they slip out to Starbucks for breakfast on the go? Will they develop reasons for in-city lunch meetings or after work “networking” cocktails? Will friends and family take pity on them and invite them over to enjoy someone else’s home cooked meal? How will their enthusiasm towards healthy eating be affected? How will their culinary creativity be tested? And most importantly, of all the challenge questions, what happens if the construction plans take longer than 12 weeks? Over the next several months, Michael and Renee, will share in their own words how things are going. They’ll report on what they are making and how they are feeling. They’ll talk about how the construction is evolving and about how their initial hopes and aspirations have been received by the physical parameters of the construction process itself. And if everything goes south (no pun intended!) and they find themselves without the ability or the desire or the space to properly cook they’ll share those thoughts as well. It’s a food lover’s journey trekking across a bumpy pumpernickel road that stretches out over a quarter of a year. Will it sprout new innovations or will it turn their minds into toast for a dozen weeks? Let’s jump right in and see! When we moved out of the West Village and bought our house in our “micro-urban” town in southern Westchester County, NY we did so with a firm and well-defined 5-year plan. Nine years later, we are about to embark on what should’ve been our year two project. To quote the sage Mike Tyson, “everybody has a plan until you get punched in the face.” Thanks, life. Joking aside, we really like living here and we really love our home. We have a better commute than most people that live in the confines of the Five Boroughs, and we get all the perks of the ‘burbs…the car, the trees, the backyard, the nosy neighbors…well, maybe not everything is a perk. So, when we recently decided that it was time to either trade-up or up-grade we came to a fairly quick decision that we would do some serious renovating and stay put. When we say “serious renovating” we’re not kidding – we’re talking new kitchen, extension off the back of the house, new siding, new family room, and a new deck. We got the ball rolling back in October and quickly found a contractor, got the plans in order and started looking for appliances and materials. We figured that by late February we’d be done. As of today, the anticipated start date on the project is February 15, with a 12-week estimated duration. Given that we started out 7 years behind schedule, that’s not so bad. One of the key sacrifices we’re going to have to make is being without a kitchen for a few months. We are the type of people that have almost every single meal we eat come from our kitchen. Breakfast at home every day. We take lunch to work every day. We cook dinner at home almost every night (gone are the days of restaurant hopping in the West Village, but we still get out sometimes). We are honored that our good and great friend Ms. Jeannie has asked us to chronicle this process for you, Dear Reader, on her amazing blog. We hope that we can do justice to her gracious request, and we hope that we don’t scare too many of you away from the joys of home improvement. 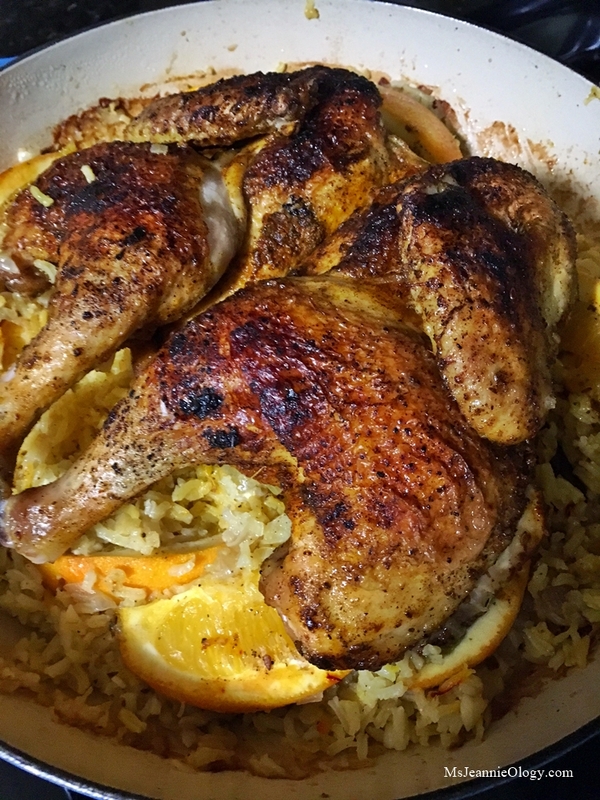 For this first blog post, we are paying homage to the first meal we cooked in our home almost nine years ago – Roast Chicken and Risotto. 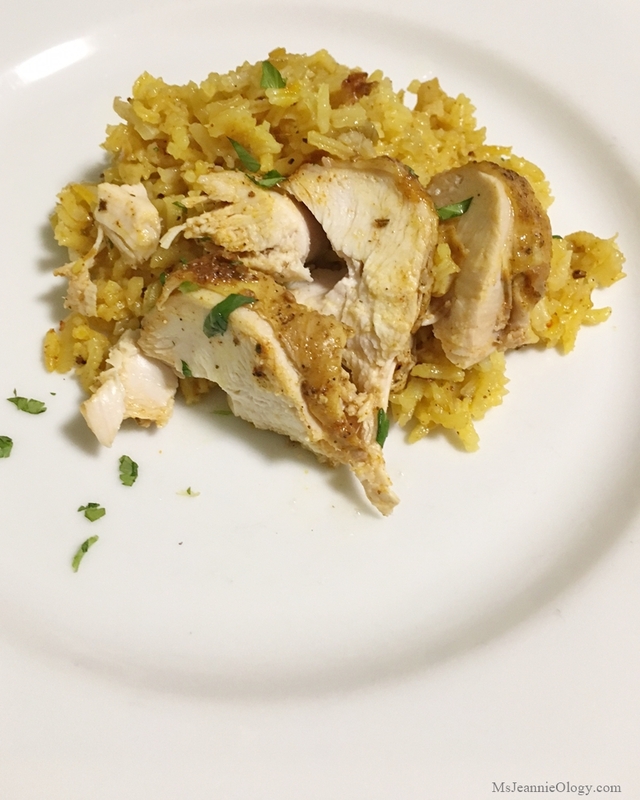 Our palates and our influences (and, for one of us, our cholesterol levels) have changed considerably since those bygone days, so our “updated” chicken dish is a little Israeli, a little Moroccan, a little Spanish, and a little local Farmer’s Market. In subsequent blog posts, I expect that our recipes will reflect the state of (or complete lack of) our kitchen, but for now happy cooking! We encourage comments, requests, suggestions and commiserations from other renovation survivors. 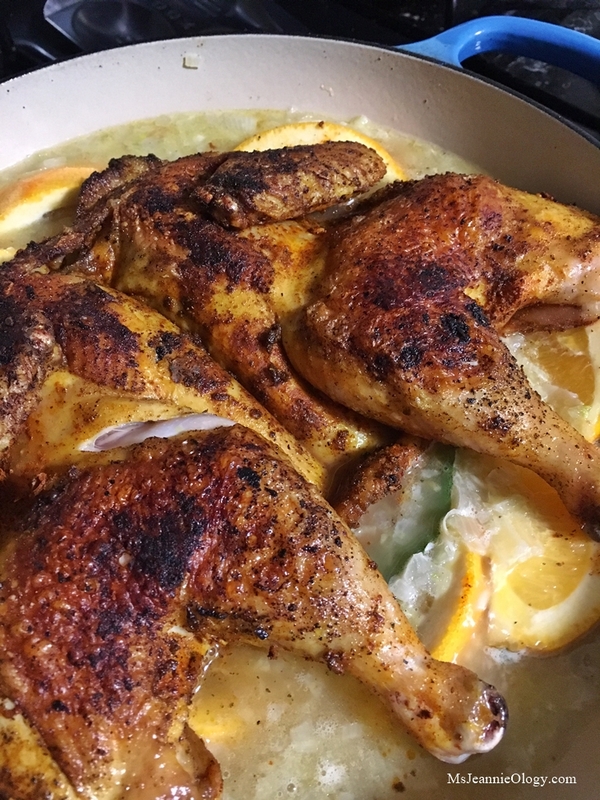 Up to two days before, spatchcock your chicken. 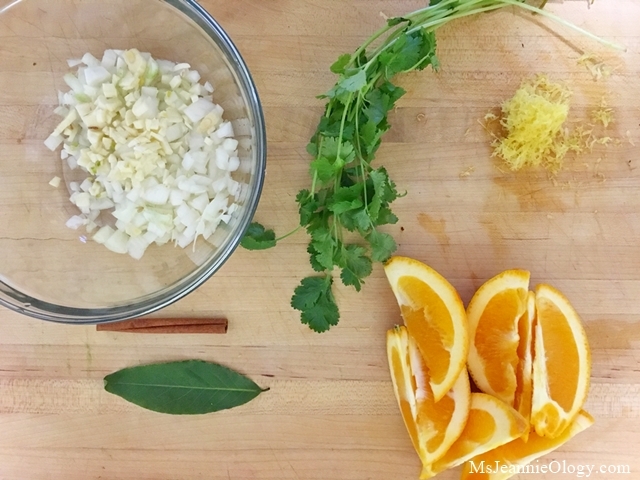 Combine the first three ingredients of the brine in a large bowl and whisk well. Add the 4 cups of water and whisk until fully combined. Add the chicken to the bowl, cover and refrigerate overnight. The next morning, remove the chicken from the brine and pat dry. Discard the brine. Transfer the chicken to a rack breast side up. 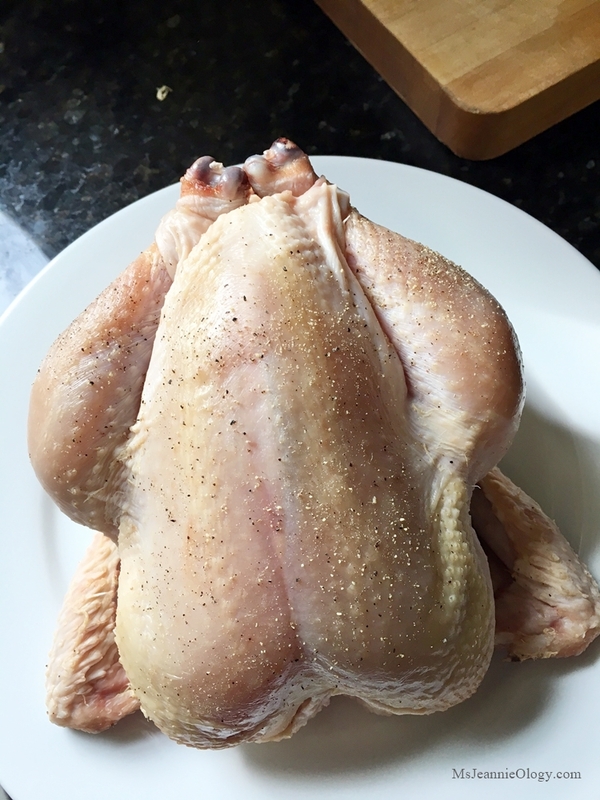 Season the skin with kosher salt and black pepper and return the refrigerator, uncovered for 8 – 24 hours. 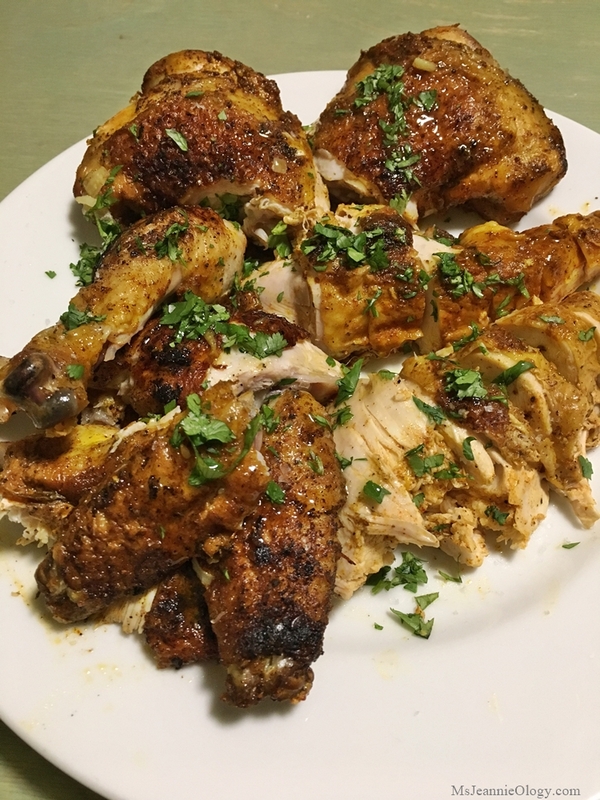 Remove the chicken from the refrigerator and sprinkle both sides with the za-atar, paprika and turmeric. Set aside. Place a rack in the center of your oven and preheat to 325 degrees. Heat a wide dutch oven or large sauté pan with a tightly fitting top on medium-high heat. Heat the olive oil and add the chicken, skin side down, and brown for about 4-5 minutes without moving. Meanwhile, warm the chicken stock in a saucepan on low, or in a microwave, and add the saffron and cinnamon stick to bloom. Remove the chicken and reduce heat to medium low. Add the fennel, garlic and leek and sauté until soft and translucent, about 5-8 minutes. Add the rice and toast until fragrant, about 3-5 minutes. Add the chicken stock and saffron mixture and citrus to the pan. Increase heat to high, and bring to a boil. Then reduce to a simmer, add the chicken and cover. Move the pan to the oven and cook for approximately 35 – 40 minutes, or until the rice is cooked and a thermometer inserted into the thickest part of the breast reads 165 degrees. Remove chicken from the pan to rest. Fluff the rice and plate, garnishing with pomegranate arils, herbs and a fresh lemon juice. Carve the chicken and plate on top of the rice. Such a fitting farewell meal to all the fun times Michael and Renee have enjoyed in their vintage kitchen. Cheers to another 70 years of good times to come when all the renovations are complete! Next time we catch up with these two bravehearts we’ll learn about the specifics of their construction project and see how this whole fresh food situation is faring. In the meantime, if you missed Renee and Michael’s other recipes featuring Greek olive oil and oregano find them here. And if you have any words of advice or helpful suggestions as these two get-going, please post a comment below! Photo credit: All photos for this post are courtesy of Michael and Renee. Ms. J, love your blog. I’m a long time reader but this is the first time I have ever commented. Many years ago I replaced countertops, flooring, cabinetry and appliances in my kitchen – not vintage just outdated. It was a mess for weeks and because i had two grade-school aged kids and a husband at the time we ordered takeout more times than I’m willing to actually admit. Because of all the excess salt and greasy foods we felt as terrible as our place looked while under construction. I applaud Michael and Renee for watching out for their health. I’m convinced it will make all the difference in the joy of this project. I wish them the best of luck and hope they will be able to stick to their goal during the challenge. Thank you so much Aggie for being a long time reader and for sharing your story! You are a champion for tackling your big renovation project with little ones in toe! Since you are a voice of experience, if you have any fun, simple suggestions (food related or otherwise!) that might help Renee & Michael along the way please comment away! Great article and look forward to following this series of writings. Thank you so much Gloria! So glad you enjoyed the post!